Who says you can’t work and still work it while you’re pregnant? Once your bump makes its debut it can be tricky rocking your favorite looks. Your back is starting to hurt, your feet are beginning to swell, and your old staple pieces no longer flatter you or your new bump the way you’d hope. What are we suppose to do? Wear sweatpants and give up? No way mama! Versatile pieces are essential in your maternity wardrobe. The Ponte Knit Blazer and the Ponte Ankle Leggings are my go-to when I want to look and feel my best. Being pregnant doesn’t mean you have to compromise your sense of style, you can still dress for you. This pant and blazer combo makes me look put together, feel comfortable, and most importantly gives me options of dressing it up or down depending on the occasion. If I’m channeling my inner cool mom I’ll pair the pant and blazer with a cozy active wear tee and my favorite sneakers. 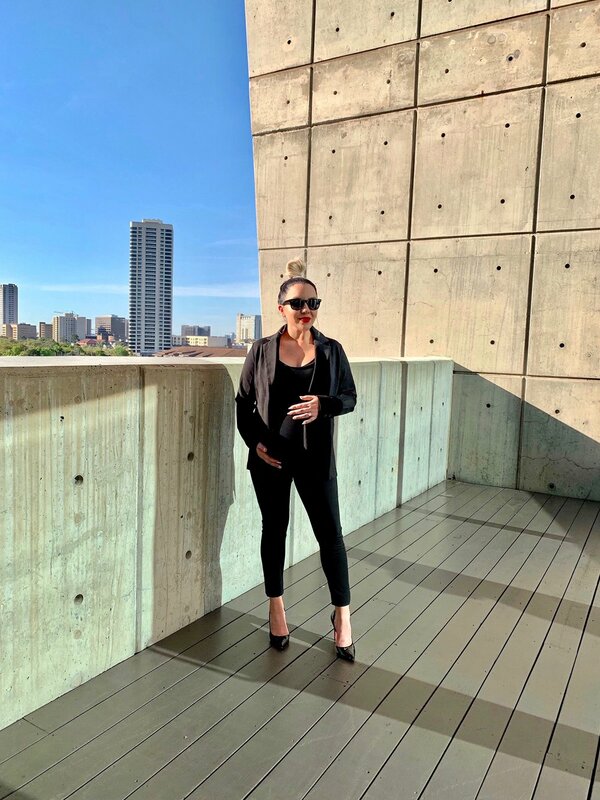 A slick ponytail and some sunglasses can accessorize the look because let’s face it, growing a baby is no easy task and some days call for dry shampoo and sunglasses. I love this look because it’s where fashion and comfort meet. You can still rock one of your favorite trends and feel good while doing it. If you’re off to work and still want to look like the boss mama, you are. Put on your heels and trade the messy ponytail for a chic bun and a bold lip. With a quick change of shoes and hairstyle you can have a completely different look that’s polished and work ready. Pregnancy can be tough and you may not always feel your best, but you can certainly look it. A woman dressed in a tailor fitted blazer with a bump in tow is a force to be reckoned with, work it mama. Wait! Did someone say tailor fitted blazer? Yes, you heard it right! What I love most about the Ponte Knit Blazer is the adjustable waist band that allows you to wear it pre and post pregnancy. The adjustable waistband tailors the fit conveniently highlighting your bump at every stage. It’s genius! When it comes to versatile pieces the fabric and quality are essential. You want a quality knit fabric that has a semi matte finish, allowing you to make an easy transition between your casual and classy looks. The Ponte Knit Blazer and leggings are perfect! I’m so glad I don’t have to give it up postpartum it’s way too stylish and comfortable to let go of. Seeing your body change is an adjustment, to say the least. I’ve had my fair share of morning meltdowns when I’m trying to get ready and nothing fits, I don’t feel my best and I just want to give up. Finding pieces that highlight your bump and embrace your new curves make a world of difference and definitely adds to your, already fabulous, pregnancy glow. Give these versatile pieces a shot and don’t be shy to add your own flare to them! Kristin Coronado is a former graduate student who turned her part-time blog into a full-time writing career. She’s a first time mother to be who is excited to add “mom” to her resume. Her goal is to empower other working mothers who want to feel and look their best all while balancing a healthy lifestyle, career, and motherhood. Babymoon Spring Vacation Edit: What to Pack!